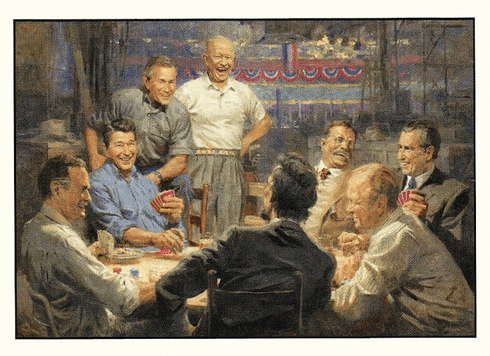 The Grand Old Gang Republican Presidential puzzle features: George H.W.Bush, Abraham Lincoln, Gerald Ford, Richard Nixon, Teddy Roosevelt, Dwight Eisenhower, George W.Bush and Ronald Reagan. Gather around and have a great time with these Republican Presidents. This puzzle is Eco-Friendly and printed with Soy-Based Inks on Recycled Board. Proudly made in the USA. 500 Pieces Puzzle Size: 13" x 19"